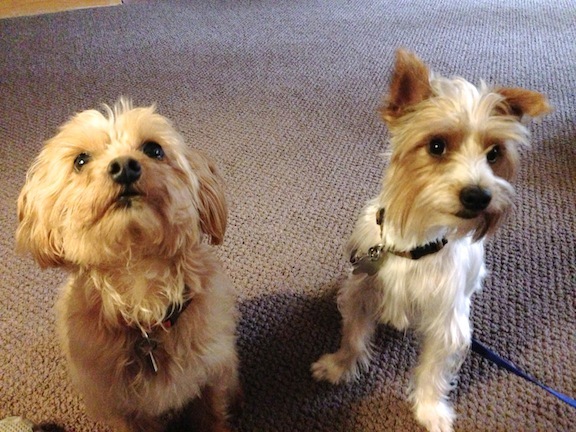 Meet seven-year-old Cairn Terrier / Poodle mix Frankie and his new pal Finn, one-and-a-half year old Silkie Terrier. You wouldn’t know it from their photo or when you first meet them in person, but both are three legged dogs. Frankie has been in the family for years, but Finn only recently joined the pack. Their owner called me in to help with Finn who had been marking in the house and didn’t know how to use the stairs. When I arrived, both dogs barked a few times but were pretty well mannered. Finn was on a leash to prevent him from sneaking off to potty inside. I laughed when i saw that and told her owner i recommend the same thing when i work with a dog who has accidents in the house. In addition to the leash, one of the first things I do when I have a client with a dog who eliminates in the house is to ask what the command to potty is. When a dog doesn’t have a clear command for this activity, it can make things confusing as humans have a tendency to ask in different ways. People all know dogs can’t speak english, but the way we interact with them sometimes makes you think otherwise. To a dog, “Go outside,” “want to potty,” “need to go,” etc all sound completely different. I suggested a few words to choose from then explained how to tie the word to the action. In this case, following the dog outside when its time, then calmly repeating the command word over and over while the dog is eliminating (#1 or 2). By repeating this word every time the dog goes for a week or two, the dog starts to see the command and the action as linked. Once this is the case, you can say the command word to the dog when you think it needs to go. If the ears go up, the dog barks, stands up or shows excitement, you know its time for a trip outside. I suggested that for a month, the family not allow the dogs onto the couch. This difference in the height at which we sit helps the dog literally see there is a difference between human and canine. Both dogs attempted to ignore this new rule by jumping up on the couch a few times so I showed their owner how to disagree when they did. After a handful of corrections, both dogs got it and stayed on the floor for most of the remainder of the session. After going over a few additional leadership tips and exercises, we went over to the stairs to tackle Finn’s reluctance to use them. Stairs can be a challenge to any small breed dog, but when that dog is working with three legs, things are even more challenging. I started out by placing a few high value treats on the tip of each of the first 4 steps, then one on the floor in front of the steps in an attempt to “Breadcrumb him up”. At first, all Finn would do is take the treat from the floor, but we stuck at it and soon he was getting it off the first step as well. After quite a bit of encouragement, I was able to get him to get to the second step, but that’s as far up as Finn would go. After retrieving that treat, he would walk away from the stairs completely. Because the treats did motivate him, I placed another one on a fishing line and attempted to coax him up the stairs that way. While it captured his attention, I couldn’t get him to go further than the second step so I needed a new strategy. After pondering it for a minute, a light went on in my head. I picked Finn up and carried him halfway up their stairs. The new strategy worded, sort of. Finn made his way up to the top of the stairs, but refused to come down. I grabbed him and kept positioning him halfway up the stairs but each time he would only go up. After a few attempts at this it became clear i needed a stronger motivator. Because dogs are pack animals who dont like to be left behind, I placed Finn in the middle of the stairs again, but the is time instructed his owner to walk out the front door which was next to the steps. As soon as she left and the door closed, Finn jump walked down the stairs in short order. We repeated the process a few times and Finn’s technique got better each time until he wasn’t jumping / sliding down any more. Finn was walking down the steps. This was a really rewarding session. First off, to work with someone who’s heart is big enough to adopt not one, but two, three legged dogs was inspiring. But to be able to help solve a pretty unique problem let me stretch my dog psychology legs more than usual. By continuing to link the command word with the action of eliminating, Finn’s owners will be able to stop the accidents in the house within a week or two. I advised them to repeat the step exercise if Finn shows any further reluctance to go up or down the stairs. But I’m guessing now that he knows he can do it on his own, Finn’s fear of going down stairs is a thing of the past.